December—Wow, what a way to end a year! 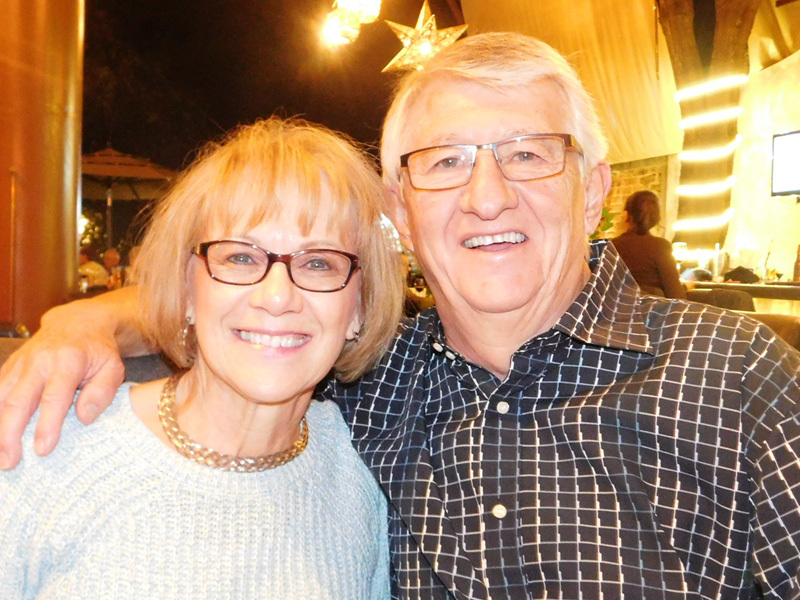 Roaming through retirement has been very good for us and here we are enjoying our ninth year of retirement. 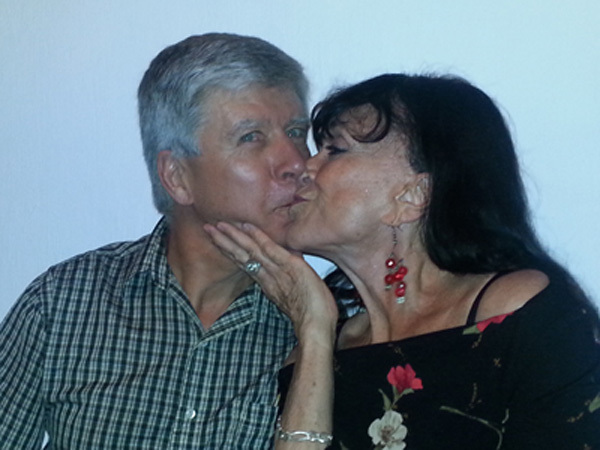 This picture was taking as we celebrated our 47th wedding anniversary. 2015 was filled with rich experiences, special relationships and an opportunity for us to contribute our talents in a creative way. We can’t wait to see what unfolds in 2016! One Friday night we were just chillin with a group of friends at a cool nightclub called Just Chillin’. What a fun way to spend an evening in retirement. The next day, Glorine wrapped up three days of sorting and pricing at the annual Raglarama, the single largest yard sale held at lakeside. It was crowded! 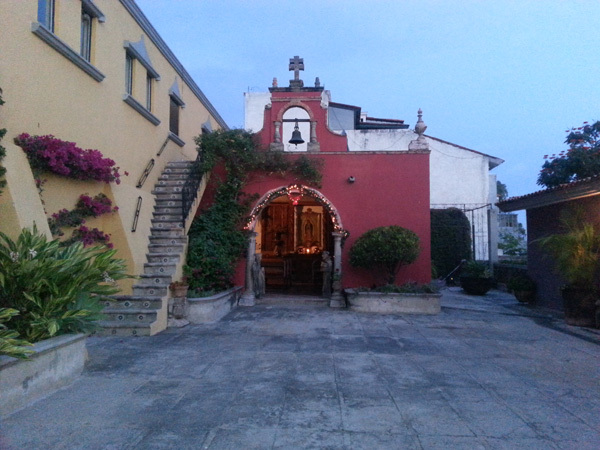 The Christmas Home Tour included this 200 year old hacienda, former seminary, now filled with designer-decorated studio apartments and this tiny consecrated chapel. 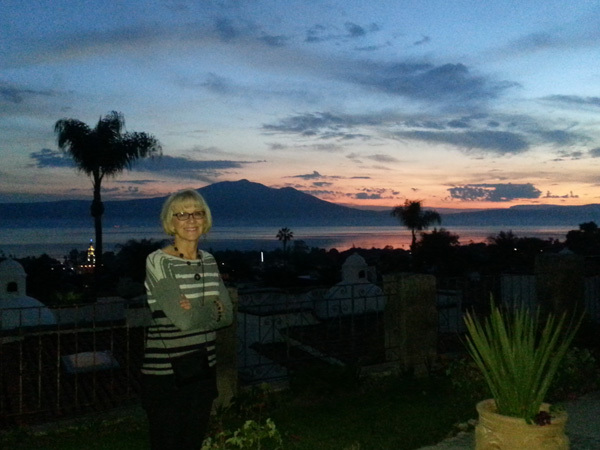 The hacienda has a view of Lake Chapala and Mount Garcia that can take our breath away and what could be better than to take in this view at sunset. 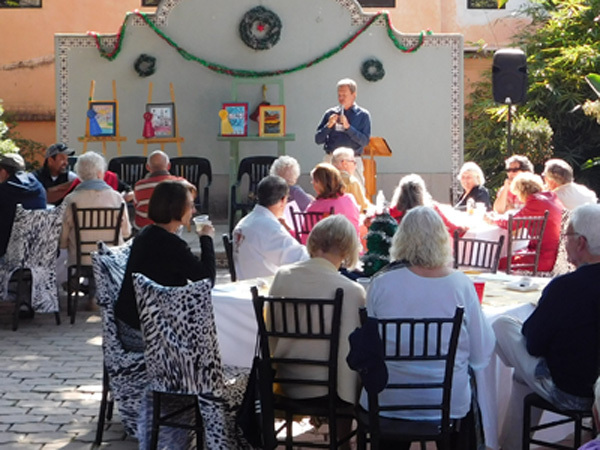 The Singles Group hosted their Second Annual Holiday Bash at the Lake Chapala Society. Glorine got to catch up with Sueke, a friend who had just arrived in Ajijic. 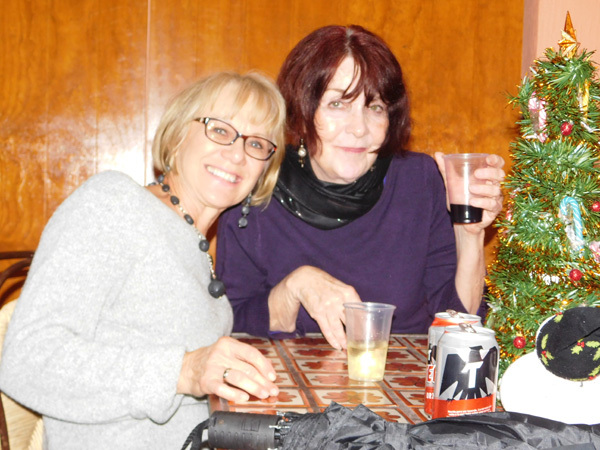 The Holiday Bash included Noe and the Band playing in the background. 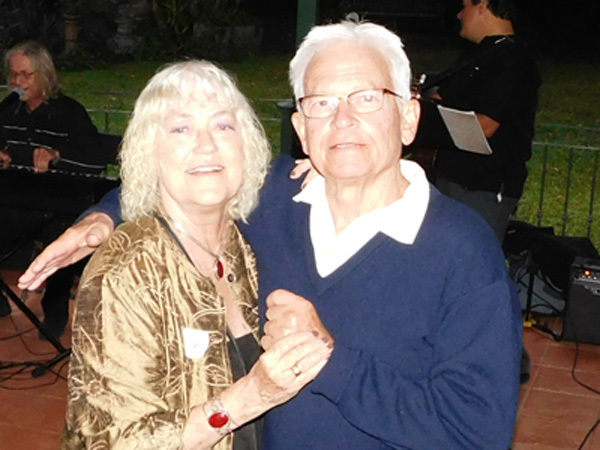 We caught Chuck and Jean shaking a leg on the dance floor, which is a large gazebo on the grounds of LCS. 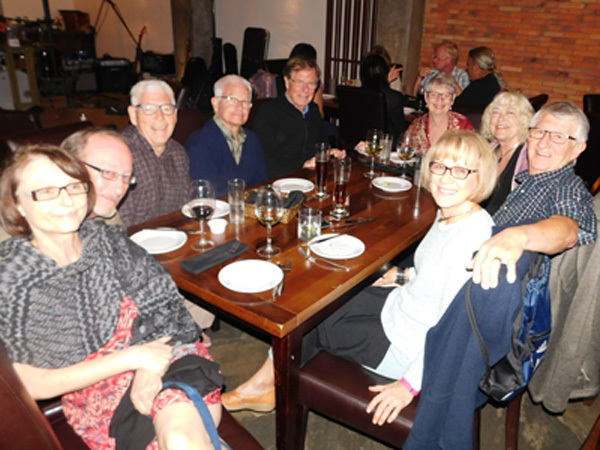 Manix drew a large group of friends on a Wednesday night to help celebrate December birthdays, including our brother-in-law Wayne. Life in Ajijic is not all parties. 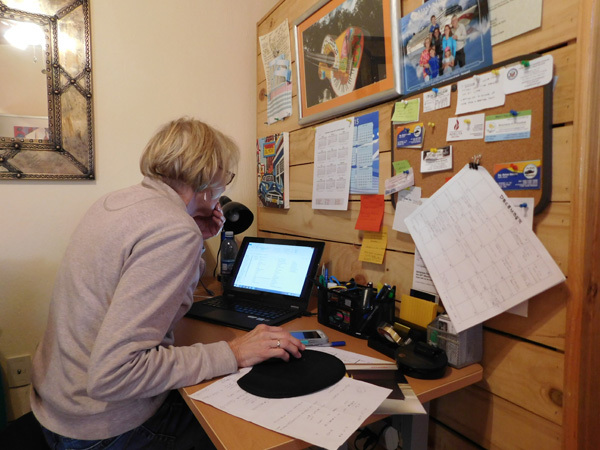 Here Glorine is doing some organizational work for a new project she created at LCS to provide greater awareness of career choices for Mexican youth. 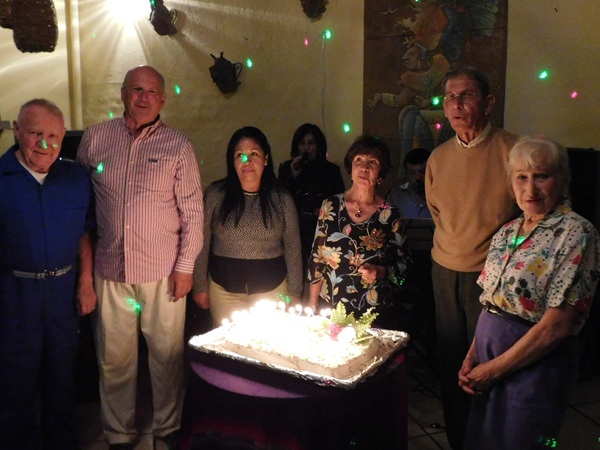 Lake Chapala Society recognized the 250+ volunteers that make it possible for them to do such great work for the expat and Mexican communities. 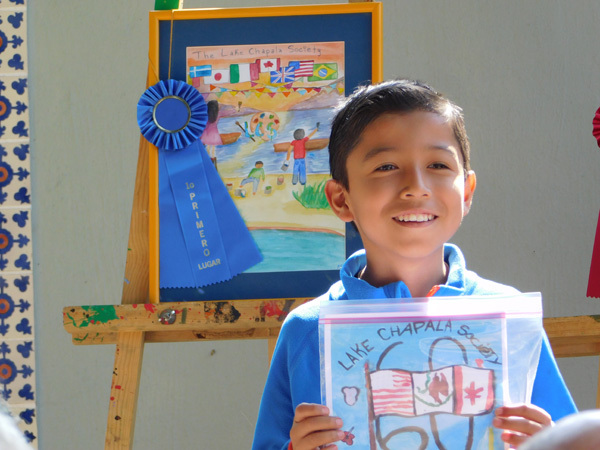 The Children’s Art Program was founded in 1954 and continues to help thousands of Mexican children explore their creative talents, including this happy lad. 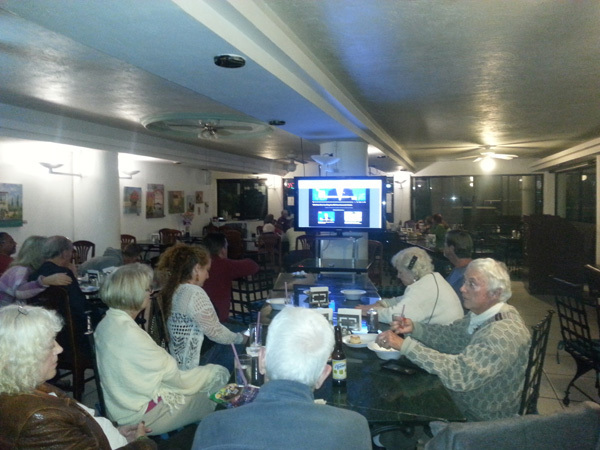 With three presidential debates held to help determine the next leader of the United States of America, Salvador’s Restaurant opened their doors for local expats to learn more about the candidates. 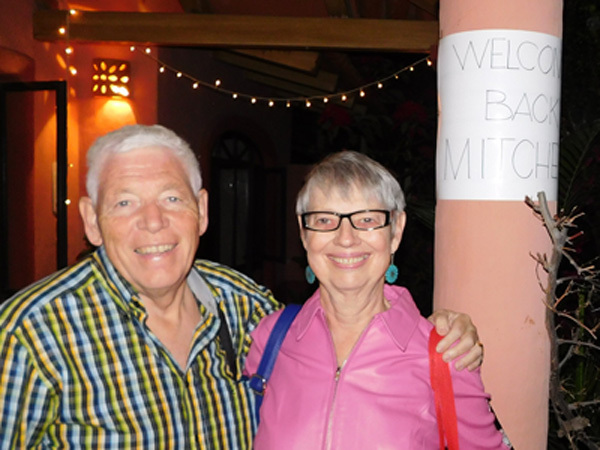 We hosted a dinner party to welcome friends Brian and Marilyn back to Ajijic. They drove from Regina Canada pulling a trailer filled with stuff for their winter home here. 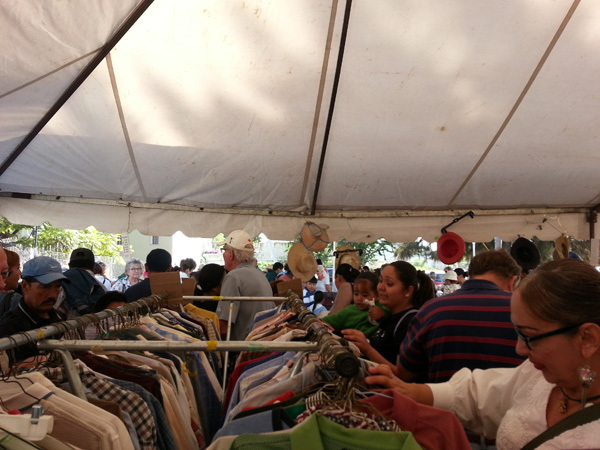 With 85 percent of the Mexicans being Catholic they take Christmas very seriously. 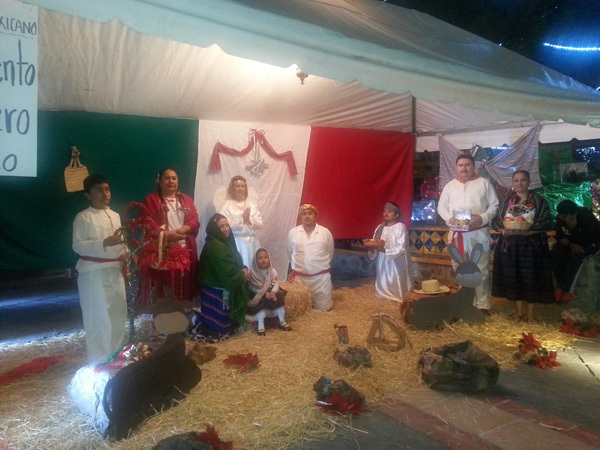 One evening we enjoyed watching several live nativity scenes as we walked the streets of Chapala. Christmas Day was a special treat. 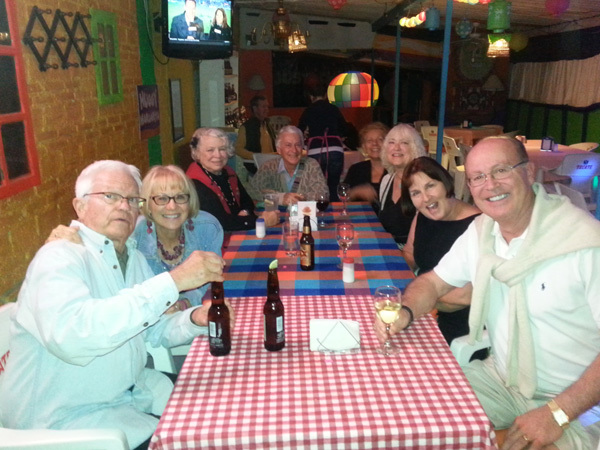 We were among the first group of people to be served at a newly relocated restaurant called GO. It included turkey with all the fixings. 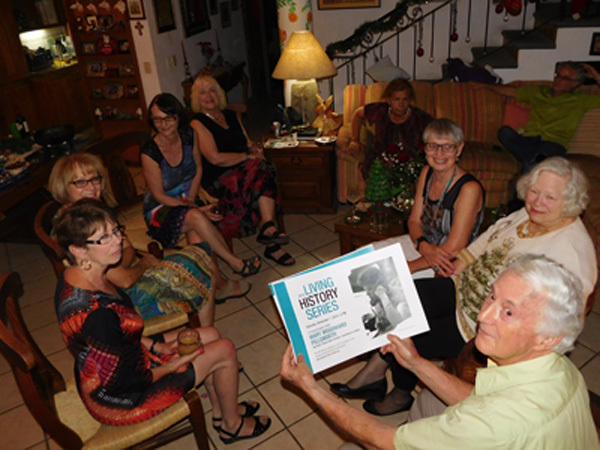 Friends Phil and Mary hosted a Boxing Day party on December 26. 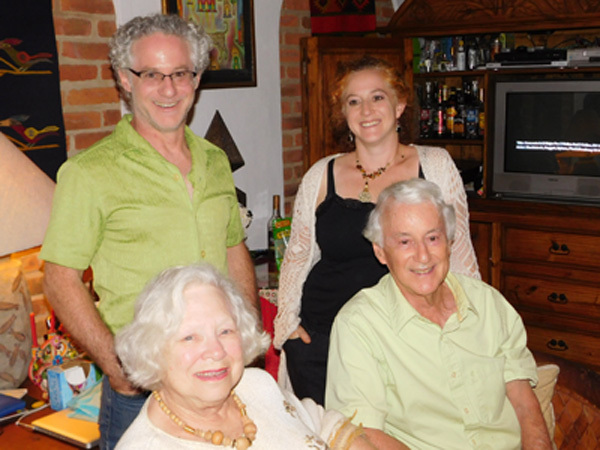 Their children Lewis and Elizabeth flew in to enjoy the holiday with them. Here they are sharing Mary’s role as a reporter with the Dallas Morning News writing her eyewitness account of JFK’s assassination for the newspaper. She quit work and joined the Peace Corp. 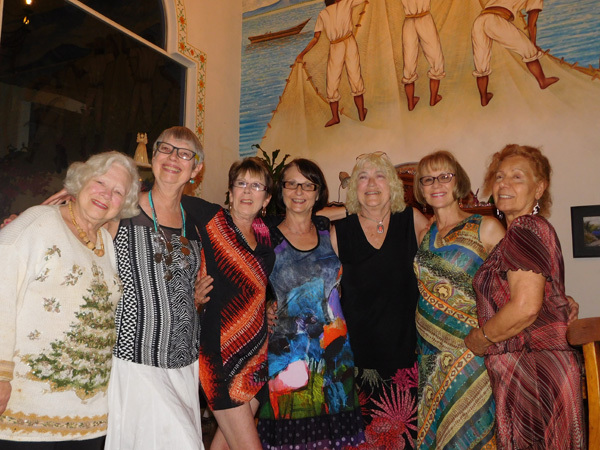 Here are a few of the girlfriends who joined in on the celebration. 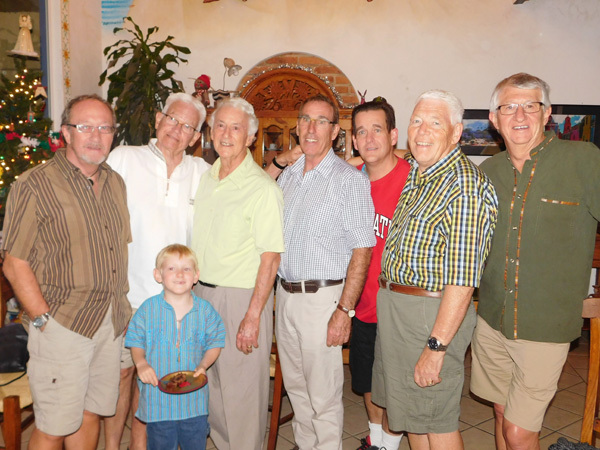 And the boys, including Elizabeth’s son, Jimmy. Molly and Mommy were taking a nap. 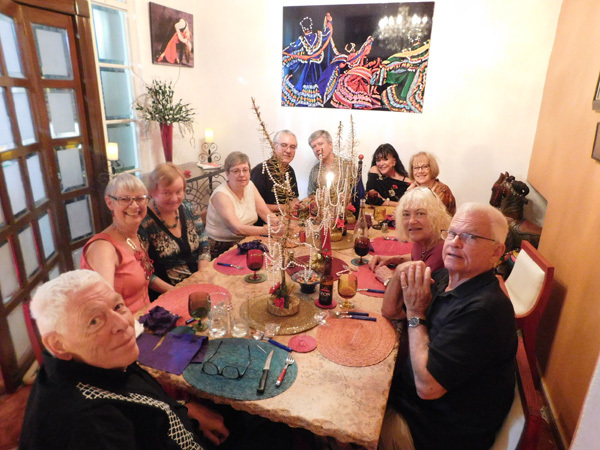 We were invited to a post-Christmas dinner party hosted by friends Norm and Lil in their new home. The walls are lined with award winning photographs Norm had taken. Norm and Lil met in 2007, which is the first year we started coming to Ajijic. They were both single back then and are now enjoying the good life of Ajijic as a couple. 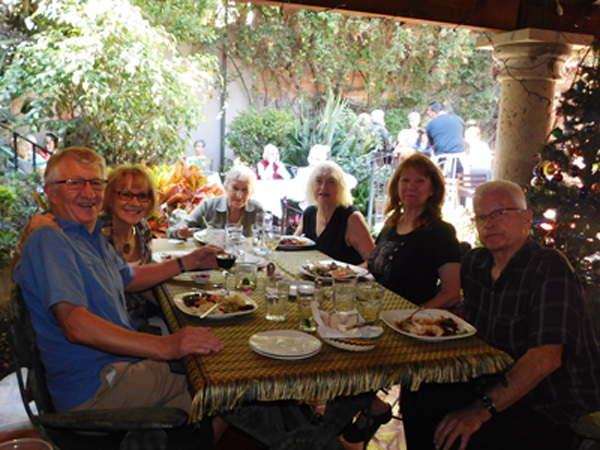 Friends join Chuck and Jean and us as we celebrated our 47th wedding anniversary on December 28th at Adelita’s. It was great night out on the town! This is something you don’t normally see at a restaurant, especially in the USA. 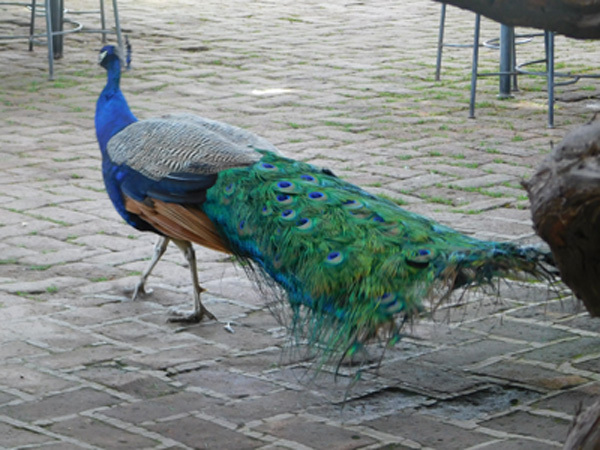 In addition to this Peacock, there were cats and chickens milling around. 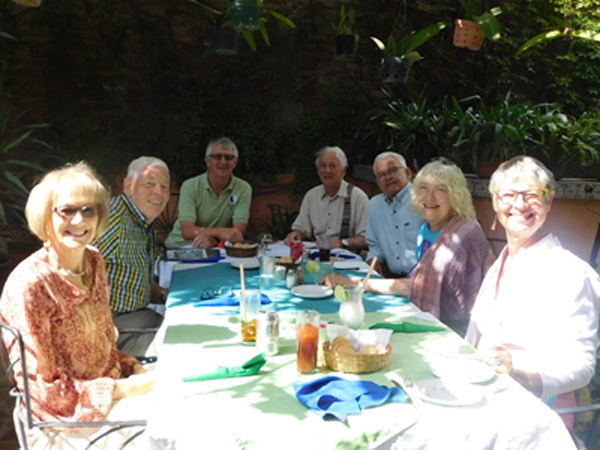 We used the Peacock Restaurant as our farewell luncheon for friend’s Chuck and Jean who were ending their winter stay early to fly back to California for medical reasons. Best wishes Chuck! We counted down the clock at midnight with a group of friends to say farewell to 2015 and ring in the new year. 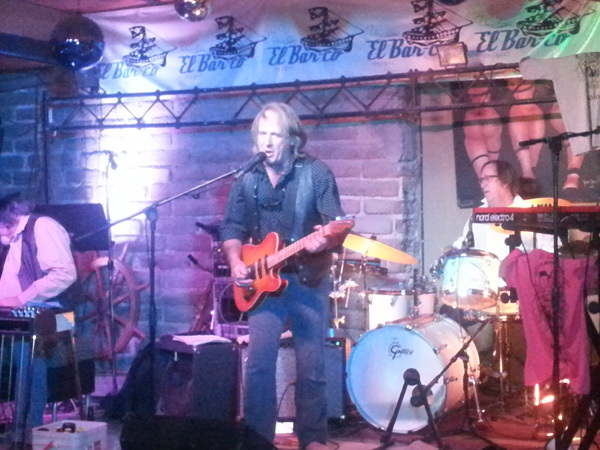 The Tallboys Band are adventuresome rockers who made the evening extra special. Click to listen to their music. December's web page includes December 1 through December 31.